NYC Taxi Driver Dies By Suicide After Facebook Note On Financial Struggles NPR's Scott Simon talks with Bhairavi Desai, executive director of the New York Taxi Workers Alliance, about a driver's suicide and the financial challenges drivers face in a changing economy. 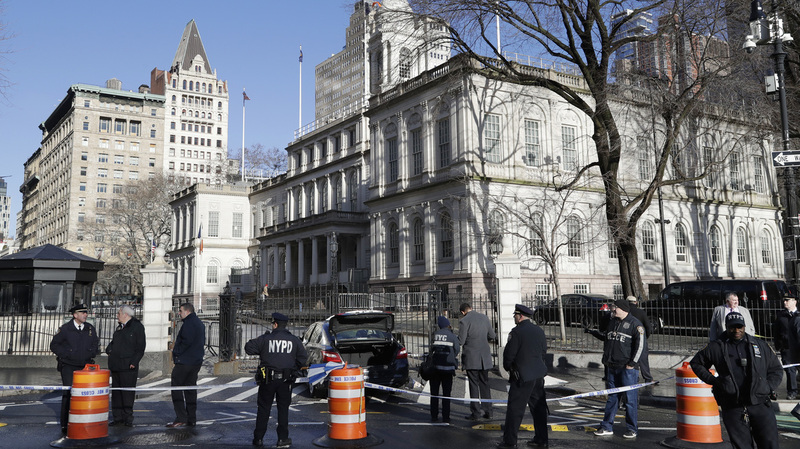 Police investigate a car stopped in front of a security gate this week outside City Hall in New York. Douglas Schifter, a longtime New York City livery driver, took his life in front of City Hall. "Companies do not care how they abuse us just so the executives get their bonuses," he wrote. "Due to the huge numbers of cars available with desperate drivers trying to feed their families, they squeeze rates to below operating costs and force professionals like me out of business. They count their money, and we are driven down into the streets we drive, becoming homeless and hungry. I will not be a slave working for chump change. I would rather be dead." Bhairavi Desai, the executive director for the New York Taxi Workers Alliance, spoke with NPR's Scott Simon about how the industry has changed, the challenges drivers face and what she thinks needs to be done to address those problems. You know, Doug really summed up the reality of a vicious race to the bottom. It's a business model that's specifically aimed at turning a full-time profession into part-time, poverty-paid gigs. And no driver wins a race to the bottom. Yes. I had a member tell me yesterday this is his typical day: He works — he sleeps for seven hours, says he has two hours for himself to take a shower, eat a meal at home, say hi to his wife and kids if they happen to be at home, and then he's out driving. He hasn't had a day off in three years ... Sometimes you take home 25, maybe 50 bucks at the end of your 12 hours, and the thing is — it feels like there's no end in sight. Well, first and foremost, there really does need to be a cap on the number of vehicles. You know, and I think it'll give workers a fighting chance at earning a decent living, and it won't clog the streets anymore so others can get around. Also, we need to establish one metered rate. Imagine if across the economy, there is no minimum wage to protect the workers. It would be slave-like conditions. Third, we need to see an increase in the rate that we have today for drivers. I've been organizing taxi drivers since 1996, and I've never seen the level of desperation. I've started to receive so many calls from drivers seeking resources for suicide prevention and talking about homelessness and eviction notices, and so, something has to be done here. This is not accidental, working people have a right to be protected. We have a right to work with dignity and justice. And that can be done through proper regulation.